Home Fact-Check Did Ravish Kumar "expose" Kiran Bedi on the car-towing incident? Did Ravish Kumar “expose” Kiran Bedi on the car-towing incident? Let me start by making this clear: Till today I had no idea anybody had towed away Indira Gandhi’s car, when she was the Prime Minister, for a parking violation. It was only when I saw some people on my Twitter timeline rejoicing that Ravish Kumar had managed to extract a confession from Kiran Bedi on this issue, did I realise that something like this ever happened. And because of this, I believe I have a chance to objectively analyse the facts, rather be driven by propaganda fed for years. Ravish: Did you tow Indira Gandhi’s car? This apparently was the confession. 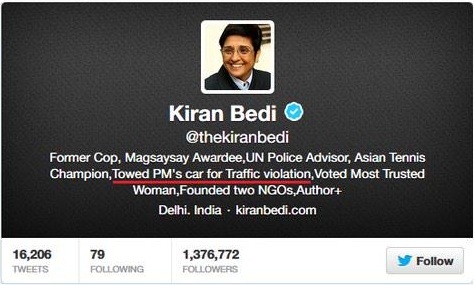 And the reason why this is so significant to a few is that apparently Kiran Bedi, until recently, claimed in her Twitter Bio that she “Towed PM’s car for Traffic Violation”. I have never followed Kiran Bedi so I can’t verify this claim, But a twitter user @scotchism did post the following screenshot which shows the above words. Again I have no way to verify this, and such images can easily be generated. As another user @ankurs7 pointed out, this is indeed a screenshot of her profile as on 11th January 2014. But before I saw this, I was shown this page from Kiran Bedi’s own website www.KiranBedi.com, by another Twitter user @St_Hill. The page contains two newspaper clippings from August 1982 (when the actual towing took place), which very clearly show that Bedi never towed the vehicle herself, but only staunchly defended the work done by SI Nirmal Singh. I checked the earliest possible version of this page, to see if this was modified recently, but even this version was the same as what you see today. So if Bedi, via her own website never claimed that she towed the PM’s car, why is it such big news when she admits to the same in an Interview with Ravish? For this, I take you to where it all began, the tweet on my TL which informed me that such an incident even happened. Twitter user @Joydas tweeted this article of the Economic Times, which says Kiran Bedi said, and I quote, “I knew that I will be transferred when I decided to lift Indira Gandhi’s car (for wrong parking). I gave a thought to it and decided to do what was right then“. She said this, at a school function in Bhopal. Now if the reporters have quoted her correctly, this sounds like Kiran Bedi claiming she personally towed the vehicle. Which is why her “confession” on Ravish’s show makes news. Her statement can definitely be misleading for school children, but people who are more knowledgeable and mature than school children should interpret it in the correct manner. Her own website says she never towed any car. She was the Deputy Police Commissioner (Traffic) at that time. Given that a Deputy Commissioner would never go on the road and personally tow a vehicle for wrong parking, Kiran Bedi’s statement can be understood in a different perspective. Let us say if after ten years, Modi says in a speech “Maine Ganga ko saaf kar diya”, does it mean he personally went into the river to clean it? Or did he do all that was needed to get it done? And what about the common slogan from Congress that “Rajiv Gandhi brought computers to India”. Surely Rajiv Gandhi didn’t stand in the Customs Red Channel waiting to declare thousands of computers! Similarly, as the news report on Bedi’s site says, she “started a drive against wrong parking“. As per the report on the Hindustan Times, Nirmal Singh towed the vehicle once he was challenged to take action against the PM’s car. To respond to such a challenge, a mere SI would probably need the backing of his seniors, which could have come from the “drive” Bedi had started almost a year before the incident. And this backing was clearly shown, when Bedi categorically said that there was “no question of taking any action against the traffic sub-inspector“. Where Bedi can be faulted is for her speech at the school function where she said (as per Economic Times) that she towed the vehicle. It’s wrong here only because she said it to school children, without giving them the entire picture. But Bedi must also be congratulated for taking on the Prime Minister, that too one of the toughest PMs India has seen, and backing her juniors to the hilt, without succumbing to any political pressure. It is because of this attitude that she’s alleged to have not gotten some Medals for her service. P.S. Before you brand me a Bedi Bhakt, read this earlier piece by me.